Car giving you a bit of a trouble and your determined to fix it yourself. Let us guide you through disconnecting and reconnecting your car battery. For safety reasons ensure that you turn off your vehicle engine. Once completed, Disconnect the negative terminal of the battery. This terminal is usually a black cable or has a “Negative,” sign on it. You can use a Combination Wrench to loosen the bolt on the, twist the bolt anticlockwise until it can be easily removed. Repeat the same procedure to remove the positive (red) battery cable. Once completed, cautiously remove the battery from the battery tray as batteries are very heavy and may lead to injury. Check out Replacing Your Battery for more detailed instructions on battery removal. First step in cleaning your car battery is protecting yourself. At any point during the cleaning process the battery could burst or leak corrosive content so for safety purposes please ensure that you wear latex gloves and goggles. The next step is to clean your car battery, this can be done by using baking soda and water as the cleaning agent. You will need a wire brush and a mixture of 1 Tablespoon to 2 Cups of water. Use the brush to remove corrosive build up and baking soda solution to soften these build ups. Be sure to use a rag that has been dampened to remove baking soda once completed. Sandpaper can also be used to remove build ups in the event that you do not have baking soda. Using any of the above mentioned abrasive methods of your choosing, scrub the battery cables as well as the connections at the end of the cables in your car until most or all of the corrosion is gone. You are not complete until you’ve applied a Corrosion Protection material at the end of the cables in your car and on your battery. Check the cables for damage, if there are breaks in the cable, they should be replaced. Ensure the terminals are dry. You are now ready to reconnect your battery. Here is a video detailing how to properly connect a car battery and steps to prevent or minimize corrosion. The final step of reconnecting your car battery is important for car shipping preparations as a vehicle whose engine does not readily start will be treated as inoperable. Inoperable (non-running) vehicles are shipped using specialist carriers with a winch. 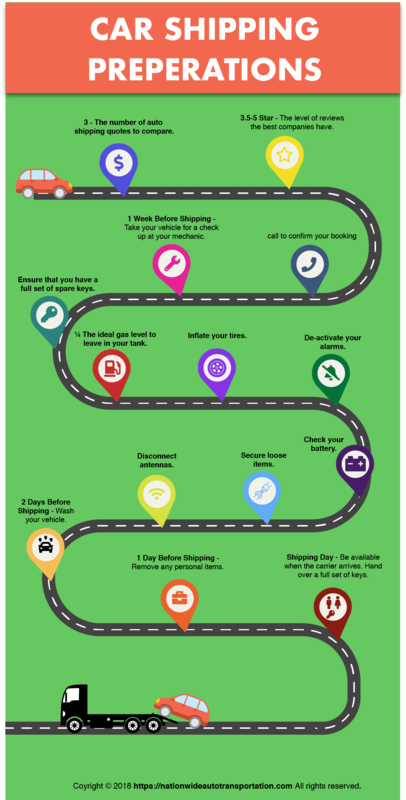 If it is that your vehicle is not running be sure to inform the dispatcher while arranging the details to have your car shipped so that arrangements can be made to you the best possible shipping experience.